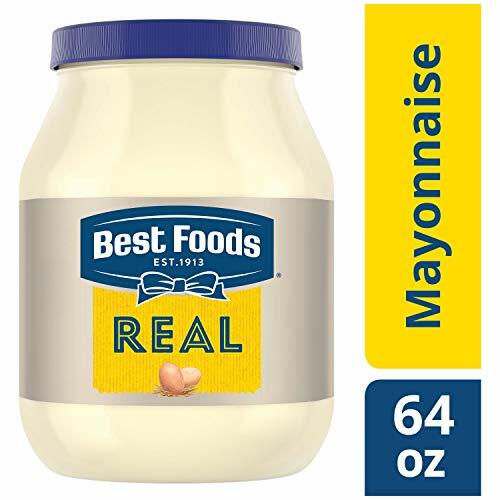 Best Foods Real Mayonnaise is proudly made with real, simple ingredients like cage-free eggs (at least 50% in every pack), oil and vinegar. We know that to really "Bring Out The Best," we need to do more than just taste great. That’s why our delicious Blue Ribbon Quality Mayonnaise is made with real eggs, oil and vinegar sourced from trusted American farms. Even after 100 years, we’re still committed to using premium ingredients to craft the highest quality mayonnaise. It's simple. We use the finest, real ingredients in Best Foods Real. In fact, we're on a mission to use 100% cage-free eggs and 100% responsibly sourced soybean oil by 2020, and we're proud to say we’re already well on our way. Our authentic mayonnaise is rich in Omega 3-ALA (contains 650mg ALA per serving, which is 40% of the 1.6g Daily Value for ALA), and is also gluten-free and certified kosher. It’s the ideal condiment for spreading on sandwiches and wraps, grilling juicy burgers, mixing creamy dips, and preparing fresh salads. Use it to make outrageously delicious meals like our Parmesan Crusted Chicken and Best Ever Juicy Burger, and even turn your Thanksgiving leftovers into a deliciously creamy meal with our Turkey Casserole. Best Foods is known as Best Foods West of the Rockies. Discover our recipes, products, information about our souring, and more on our website, Bestfoods.com. If you have any questions about this product by Best Foods, contact us by completing and submitting the form below. If you are looking for a specif part number, please include it with your message.